Filter media is made from two layers of pleated flocked wire screen cloth, frame is available in P1A aluminum and P1 steel construction. Steel frames can be plated and aluminum frames can be anodized per MIL-A 8626, Type 2 or chemical coated per MIL-C- 5541, Type 1. Resistance: .080” water @ 178 FPM to .265” water at 356 FPM. 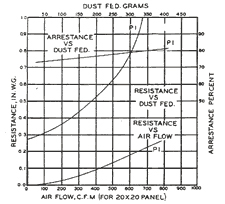 Average dust arresting efficiency is 77% using standardized dust and testing methods. Wide ranges of standard-size P1 filters are available. 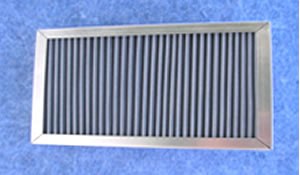 Filter thickness is ½”-1”. P1 panels are available in circular shape to fit your custom applications. It is important no air by allowed to by-pass edge around filter. Felt, neoprene, or other suitable materials should by used to form an adequate seal on the perimeter around the edge of the filter panel. The P1 can be cleaned in water and detergent solution or a suitable solvent. When dry, apply an even coat of adhesive. May be serviced as often as necessary without impairing efficiency.